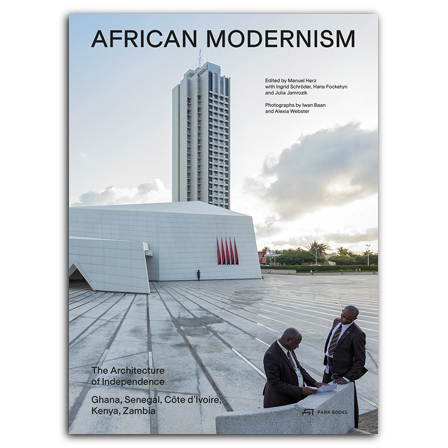 This groundbreaking new book investigates for the first time the relationship between architecture and nation building in Ghana, Senegal, Côte d'Ivoire, Kenya, and Zambia. It features 103 buildings with brief descriptive texts, images, site plans and selected floor plans and sections. The vast majority of images, commissioned especially for this book, is contributed by Iwan Baan and Alexia Webster. Their photographs document the buildings in their present state. Each country is portrayed in an introductory text and a timeline of historic events. Further essays on post-colonial Africa and specific aspects and topics, also illustrated with images and documents, round out this outstanding book. Published to coincide with an exhibition at Vitra Design Museum Gallery in Weil am Rhein. Winner of the FILAF d'or, the first prize for Best Books on Art 2015 at the FILAF (The International Art Book and Film Festival). Named one of the Most Beautiful Swiss Books 2015.
runs his own architectural firm with offices in Basel and Cologne. He has taught at Bartlett School of Architecture (London), Berlage Institute (Rotterdam), Harvard Graduate School of Design, ETH Studio Basel – Contemporary City Institute, and is currently teaching as a visiting professor for architectural design at ETH Zurich.